Whilst collectors of "pure" Guinness Book of Record editions may frown on earlier or derivative works, some of the following editions and related items are — in our opinion — related closely to Guinness Superlatives, and therefore deserve an honourable mention at the very least. The primary qualification is that the publications are primarily records-based editions (or we just like them). Again, if you know of any other interesting related editions, please let us know. This little-known book is believed to be the first "records" book. The introduction states that, "It is the only book of its kind and there is nothing either in the New York Public Library or the Congressional Library in Washington even remotely like it". Although some of the so-called records in this book are rather fanciful by modern standards, many of the records exactly match those in the first Guinness Book of Records. Truly a ground-breaking publication! 1951 Get to your Marks! This was the first book published by the McWhirters. Although this was published 4 years before the first Guinness Book of Records, it cost 15 shillings when new - three times the price of the first Guinness Book of Records. For anyone interested in the history of Track and Field athletics (particularly British competitors), this is a must-read book. 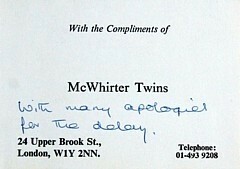 As well as detailed records of each type of event, there are many anecdotes and discussions which make fascinating reading, and show early signs of the McWhirters' style in record-book compiling. 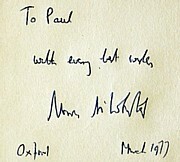 Harold Abrahams is probably now best known via the 1981 film, "Chariots of Fire". 1952 Get to your Marks! This edition is a reprint of the original 1951 Nicolas Kaye edition. The foreword states that, "This is the first comprehensive compilation of British all-time athletic personal best performances to be published." This booklet is presumably the forerunner of the "Guinness Book of British Empire & Commonwealth Games Records" series. Produced By Mister Softee Ltd. in association with the Guinness Book of Records. 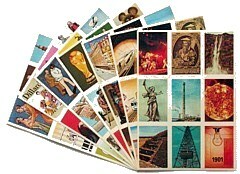 The 12 cards are: "The Unknown Sea", "Mount Everest", The Cheetah", "The Coelacanth", "Humming Birds", "Earliest Man", "Cave Paintings", "Johann Sebastian Bach", "The Great Wall of China", "William Shakespeare", "Alexander the Great" and "Man in Space". "Complete roll of Olympic Medal Winners (1896-1960) for the 20 sports to be competed in the 1964 Games and all other essential information"
Copyright Sterling Publishing Co. Inc.
Oak Tree Press, Ltd., 116, Baker St., London, W.1. This book was published simultaneously in the U.S.A. by Sterling Publishing Co., Inc.
A paperback version of the book (price 5/-) was published in Australia by "The K. G. Murray Publishing Company Pty. Ltd., 142 Clarence Street, Sydney" and printed by "New Century Press Pty. Ltd., 2-5 North York St., Sydney". George Fisher also contributed to the main Guinness Book of Records, was a London taxi driver, welter-weight boxer, snooker and billiards champion, and still had time to appear on a number of TV quiz shows. Promotional copies of this edition are known: Guinness distributed some complimentary copies (below left), and special editions for companies such as Joe Coral Ltd. (below right) were also produced. Details of Owners, Trainers, Jockeys, Records, etc. The horse pictured on the front cover is Lord Elveden's Khalkis. October 1964, Sir Edward Beharrell, Chairman, Dunlop Rubber Co. Ltd.
Two bindings were available: "Standard edition" (price 10/-) and "Fully bound library edition" (price 15/-). The standard edition is also know as the "Flexibound edition". The front dust-jacket flap says, "DUNLOP BOOK OF FACTS is the first new general reference volume to be published in Britain for many decades". The paperback (Flexibound) edition is slightly smaller at 216x114mm. Complete Roll of All-Ireland Hurling Champions (1887-1964), and National League, Railyway Cup, Provincial and Oireachtas Cup winners. The horse pictured on the front cover is H.M. The Queen's Carozza, with Lester Piggott up. Our copies are a promotional copy for Bob Pearce Ltd (above) and one for PETER (B'HAM) LTD (pictured right). A copy from Fred Binns Ltd. appeared on eBay in 2009, ones for Laurie Wallis & Co., Ltd. and George Habbershaw Ltd. appeared in 2014, and one for Reg Jackson (Doncaster) appeared in 2016. "being a record and analysis of the results of all 9 sports in all seven celebrations of these Games (1930-1962) with programme details for 1966"
Copyright Guinness Superlatives Ltd., 8 Baker Street, London, W.1. Lamport Gilbert & Co. Ltd., Gun Street, Reading, England. This booklet is produced in the Guinness Book of Records "style", in that it has a foreword by Viscount Elveden and a preface with the facsimile signatures of the McWhirter twins. The front cover shows the National Stadium at Kingston, Jamaica floodlit at night. This is the main venue for the 8th Games. A pictorial record of events that made headlines. Buckley & Bland Ltd., Stockport. presented with the compliments of Vernons Pools Ltd. Many copies of the book were given away as promotional items, by companies such as City Tote Ltd (pictured above) and Mark Lane (T.A.) Ltd. and A. & P. Stallion Ltd. (pictured right). 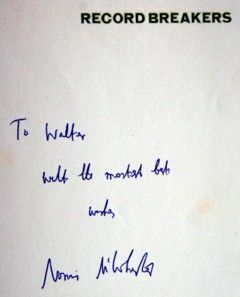 Ross McWhirter and Sir Andrew Noble Bt., K.C.M.G. "being a record and analysis of the results of all 9 sports in all eight celebrations of these Games (1930-1966) with programme details for 1970"
Publisher Guinness Superlatives Ltd., 24, Upper Brook Street, London, W.1. "Complete roll of Olympic Medal Winners (1896-1968) for the 22 sports to be competed in the 1972 Games and all other essential information"
Penguin Books Ltd, Harmondsworth, Middlesex, England. Printer Brodard et Taupin, La Flèche. Copyright Scott International (Marketing) Ltd. and David Mappin (Promotions) Ltd. Printer Sir Joseph Causton & Sons Ltd.
Franklin Watts Limited, Chandos House, 32 Palmer Street, London, S. W. 1. Printer Colour Reproductions Limited, Billericay, Essex. Printer Hazell Watson & Viney Ltd, Aylesbury, Bucks. This final section of this edition has some records from other sports. As with the earlier editions, some copies had promotional branding, such as "Sporting Chronicle", on the front cover (right). Based on the 21st edition of the Guinness Book of Records. Notes The paper "book" was published in 4 sections, and contained records from the 22nd Edition of the Guinness Book of Records. Printer William Collins Sons & Co. Ltd.
Notes "Is this a record? No, it's a Collins Calendar based on Information supplied by The Guinness Book of Records". 12 double-sided pages, each with a record from the Guinness Book of Records. Also contained an order form for the 1977 calendar. For any Guinness Book of Records collectors, this book is a "must read". As well as giving an insight into the McWhirters' passion for facts, it also documents how the connection with Guinness came about. Ultimately, of course, it is a rather moving tribute to Ross by his twin brother Norris. We have a hardback copy signed by Norris (right) and one dedicated by Rosemary McWhirter to Ronald Proyer for his article in Annabel magazine about the death of her husband. In the latter part of August 2009, we were lucky enough to be in conversation with Iain McWhirter (Ross's son), and he kindly agreed to answer a few of our questions. You can read the interview on our people page. "Complete roll of Olympic Medal Winners (1896-1972, including 1906) for the 28 sports (7 winter and 21 summer) to be contested in the 1976 Celebrations and other useful information"
Printed by Hollen Street Press Limited, Slough, Berkshire. This little book is a really good read for record enthusiasts. A second edition was published in 1980. Produced For Geo. Bassett & Co. Ltd. (Barratt Division), Sheffield, England. Each card has a drawing depicting a particular world record. The first card shows the "Roller Skating Marathon" record held by Randy Reed of Springfield, Oregon. The 50th card (right) shows the record for the "Greatest Electric Shock". We have been lucky enough to get hold of an original album from 1978. It has eight pages and is 30x21 centimetres (pictured far right). Printed by Severn Valley Press in association with Visa Press Ltd. This was a sticker collection album, with 257 stickers to collect. Packs of 6 stickers (right) cost 5p. Editor Dr. Ken Miller, M.Sc., M.A., Ph.D. Unfolded, the crossword half of the book is 2450mm (a little over 8 feet) long. All of the crossword clues are based on information from the 25th edition. "Complete roll of Olympic Medal Winners (1896-1976, including 1906) for the 28 sports (7 winter and 21 summer) to be contested in the 1980 Celebrations and other useful information"
Printed by Visa Press Ltd. This was a sticker collection album, with 300 stickers to collect. Stickers came in packs of 6 (above left) and as uncut sheets of 9 stickers (above middle). The collectors' album was also issued free with the Tracy comic and also in Scoop from January 30th 1980 (above right). A strip advertising the Scoop promotion also appeared in Warlord magazine (right). Guinness Superlatives Limited, and But Is It Art? Other spin-offs from the show included a 1981 LP of songs by Roy Castle (right) and a later tribute VHS video from 1994 (above left). Guinness Superlatives Limited, 2 Cecil Court, London Road, Enfield, Middlesex. Printed by Redwood Burn Limited, Trowbridge and Esher. Guinness Superlatives Limited, 2 Cecil Court, London Road, Enfield, Middlesex, EN2 6DJ. 56 sports and games covered in this edition. Foreword by Norris McWhirter. Edited by Shirley Greenway. Reprint of the 1980 Piccolo edition, "The Guinness Book of Most & Least". Printed by Nassus Print and Design (1982) Ltd. This is the programme for visitors to the Guinness World of Records Museum at the Trocadero in Piccadilly, London. The Museum closed its doors for the last time in December 1995. Notes "Be guided by world class marathon runners Leslie Watson and Ian Thompson, as well as by J.P.R. Williams and Jane Griffin." Copyright Gerald L. Wood and Guinness Superlatives Ltd. Printer Redwood Burn Limited, Trowbridge, Wiltshire. 8 ("Human Wonders", "Wellie-Wanging and Other Wonders", "Animal Superlatives", "The Natural World", "Building Big", "That's Entertainment", "Transport Records" and "Sporting Records". Twelve modifications in the "stop press" section. 1985 saw the start of the "Guinness Record Breakers Club". 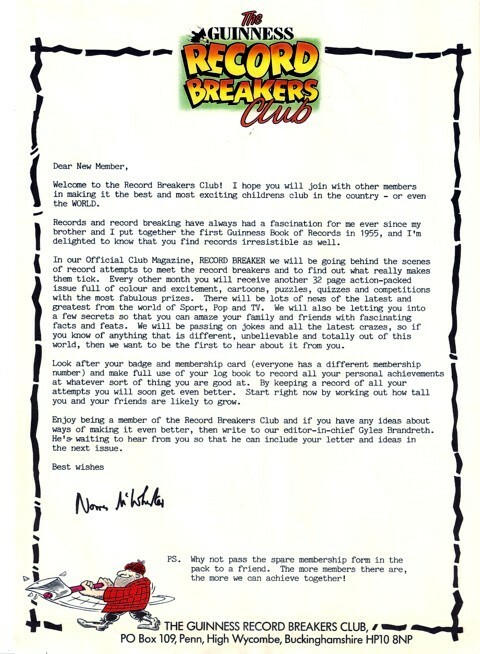 Joining the club cost £2.75 and entitled members to a membership card, club badge, personal log-book, 50p off admission to the Guinness World of Records in Piccadilly and a subscription to the club magazine, which was to be published six times a year. The first magazine (Winter 1985) introduced Gyles Brandreth as its Editor-in-Chief and included a 1986 calendar featuring Frankie Goes to Hollywood. Today we had a very pleasant conversation with Gyles Brandreth about his involvement with the Record Breakers Club. You can read the interview on our people page. This is a lovely little book which is well worth buying if you can. The paper "mechanics" are wonderful. We also have a copy of the German edition, ISBN: 3-550-07436-0(pictured right). Other titles in the Toucan Books series (though not pop-up books) included: "Beat the Record" (ISBN 0-85112-829-7), "Apple Peelers and Coin Stackers" (ISBN 0-85112-471-2), "Bomber Bats and Flying Frogs" (ISBN 0-85112-475-5) and "Bullet Trains and Underwater Tricycles" (ISBN 0-85112-476-3). Our copy was published by Book Club Associates and Guild Publishing. The book brings together the records from the Toucan Books above: "Apple Peelers and Coin Stackers", "Bomber Bats and Flying Frogs" and "Bullet Trains and Underwater Tricycles". Ten modifications in the "stop press" section. Description A book-based version of the popular board game. Publisher Guinness Superlatives Ltd, 33 London Road, Enfield, Middlesex. Printed By New Interlitho S.P.A. The game has two parts - a hardback book of 120 quizzes of 25 questions each, and a paperback book with the answers. Six bookmarks (used for multi-player quizzes) are included. A paperback edition of the book (ISBN: 0-552-13332-9, 200x200 mm) was published by Guinness Superlatives and Corgi Books in 1987. In the same year, five other editions were produced (pictured below). These were the "Young Players Quiz Book" (ISBN: 0-85112-862-9) and four pocket editions: "Rock and Pop" (ISBN: 0-85112-870-X), "Sport" (ISBN: 0-85112-875-0), "The Movies" (ISBN: 0-85112-880-7), "Genus The Master Quiz" (ISBN: 0-85112-885-8) and "The Omnibus Edition" (ISBN: 0-85112-882-3), a collection of the four pocket editions in one volume produced especially for The Leisure Circle Ltd. Printed by Jarrold & Sons Ltd, Norwich. We also have copies of the programme in French and German - if you know of copies in other languages, please let us know. 6 ("TV Records", "Stunts", "Christmas", "Trivia Records", "Entertainments" and "Sports Records"). Printer R.J. Acford Ltd, Chichester, Sussex. This special Hyundai edition has the same content as the standard hardback edition, but includes a foreword by Mike Adams (Managing Director of Hyundai Car Distributors UK Limited) and has an additional 8 pages advertising Hyundai cars, Judy Simpson and Seoul. Unlike the standard hardback, the cover is yellow and additionally has the Hyundai logo on the spine. 3 ("Personal & Public Lives", "The Natural World" and "Human Achievements". Printed by Hazell Watson & Viney Ltd., Aylesbury. The "Introduction" is the story of the Guinness Book of Records, and has photographs of Sir Hugh Beaver and Norris McWhirter (pictured with the standard 1988 edition). Text "All these facts and more in the new 1989 Guinness Book of Records." Each card has a picture and several records from one of 4 categories: "The Living World", "The Arts and Entertainment", "Human Achievements" and "Sports, Games and Pastimes". 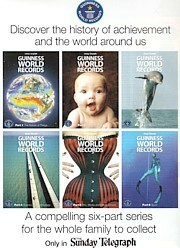 1989 Guinness World of Records - The 'greatest' show on earth! World of Records Exhibitions Ltd. Published by Ian Wolverson-Astroquail Ltd. This is the programme for the Guinness World of Records at the Trocadero in Piccadilly, London. The Museum closed its doors for the last time in December 1995. We also have a copy of the 1992/1993 brochure (above right), which has no attributions, a copy of the "Information for Schools" binder produced by Sue Rule in 1989 (right), and a copy of the 1992 Educational Resource Pack (far right). Other museums produced similar souvenir guide books - the one pictured right is a 1989 guide to the museum at the Empire State Building in New York. Each card has a cartoon depicting a particular world record. The first card shows the "Bed of Nails" record held by the Reverend Ken Owen of Pontypridd. The cards and bubblegum were made in Denmark for Barratt, a division of Trebor-Bassett Ltd., Maidstone, England. We also have a full set of Dandy Gum cards produced in Denmark for the Turkish market - these are larger (83x66mm) translucent greaseproof paper "cards". Guinness Publishing Ltd. and Charles Letts & Co. Ltd.
"The full international edition of the world's best-selling record book - for the first time in paperback." This edition contains some revised records compared to the standard hardback edition, so was presumably published slightly later. Copyright Victoria House Publishing Ltd.
Editor: Peter Matthews, Writer and Compiler: Maria Morgan. The cover has 14 different Guinness Book of Records editions - the question on the back cover asks the reader to guess the language of each edition and the year of the English ones. The Guinness Gold Club was formed in 1994 with the aim of recognising — and providing additional information to — serious collectors of the Guinness Book of Records. To qualify for membership, collectors needed to prove to Guinness that they had 30 or more editions of the book. Guinness Gold Club newsletters (in A5 format) were sent out to members from time-to-time, and we have copies of the first 5. There were also 2 magazines issued in A4 format in Spring and Autumn 1998, and an A4 "Hall of Fame 2000" booklet, containing pictures and details of some collectors. Gold Club members also received a membership card and certificate. Printer Cox & Wyman Ltd.
A ten-part series produced in collaboration with the Daily Mail newspaper to promote the 1997 edition of the Guinness Book of Records. Each part has 15 pages and an advertisement on the back cover. On the Monday following the publication of each part, the paper contained some "stories behind the records". Other books in this series included: "The Book of Time and Space", "The Book of Animals", "The Body Book", "Back to the Future" and "The Book of Inventions". Other books in this series included: "The Book of Extremes", "The Book of Animals", "The Body Book", "Back to the Future" and "The Book of Inventions". Slow Dazzle Worldwide, 38 Cobbold Road, Shepherds Bush, London, W12 9LW. A month-per-page calendar with pictures and record information on every page. The copyright page gives the ISBN as 0-85112-051-2. Other books in this series included: "The Book of Time and Space", "The Book of Extremes", "The Book of Animals", "The Body Book" and "Back to the Future". Sainsbury's plc and Guinness Publishing Ltd.
Medals (21) John Harrison, Albert Einstein, Alexander Fleming, Leonardo da Vinci, James Watt, Henry Ford, Christopher Columbus, Neil Armstrong, Alexander Graham Bell, William Shakespeare, Vincent Van Gogh, Wolfgang Amadeus Mozart, Live Aid, Charlie Chaplin, Jesse Owens, Muhammad Ali, Winston Churchill, Mahatma Gandhi, Mother Teresa, Elizabeth I, Bill Gates. Coins were collected at Sainsbury's stores, petrol stations and Savacentres. A 4-medal pack is shown above. A limited number of proof sets in Sterling silver were produced by Pobjoy Mint Limited. 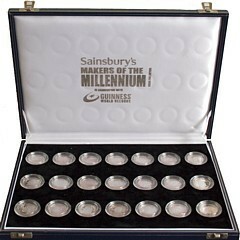 Each medal in the set was housed in its own plastic container, and the whole set was presented in a special case. Winning Moves for Guinness World Records Ltd.
Notes A special set of Top Trumps cards produced to promote the 2003 edition of the Guinness Book of Records. Ralf Laue is a record breaker and record collector, and runs the Saxonia Record Club. In November 2009, Ralf kindly answered a few questions for us; a slightly abridged transcript can be found on our people page. A six-part series produced in collaboration with the Sydney Sunday Telegraph newspaper; inserted in copies of the paper across New South Wales. The first part has 24 pages; the other 5 parts have 16 pages each. Guinness World Records provided all content. However, the magazines were designed internally by The Sunday Telegraph editorial department. 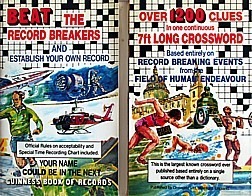 Copyright Guinness World Records Limited and Sourcebooks, Inc.
Each page of the tear-off calendar has a different record. Printed by Clays Ltd, St Ives plc. Larry Olmsted's book details the highs and lows of setting Guinness World Records. The book also documents some of the history of the Guinness World Records story, so is a "must read" for any Guinness collector. In January 2009, Larry Olmsted kindly agreed to an informal interview with us. An abridged transcript of our interview can be found on our people page. In May 2009, a paperback edition (ISBN 978-0-00-728425-2, right) was published in the UK, priced at £7.99. Notes We have the Creatures poster (PP33106, top left) and the Challengers poster (PP33141, bottom left).